Penn State University, home of Beaver Stadium and PSU Football, is located in University Park, Pennsylvania. Beaver Stadium is one of the largest football venues in the nation, with a seating capacity of over 106,000. An audio video integrator for Penn State University was tasked with finding reputable LCD enclosure manufacturers. The integrator located ITSENCLOSURES through a web search and requested additional information on the possibility of a custom solution. After initial contact, ITSENCLOSURES was invited to tour Beaver Stadium, perform a site visit, and meet with key contacts for the project. Penn State University made the decision to upgrade Beaver Stadium’s north end zone with LCD enclosures. In certain rows, the cantilevered end zone does not allow for spectators to see the scoreboard. To keep die-hard fans in the game, the University desired to use LCDs to ensure that no plays were missed in the stands. The solution would need to be suspended from the upper deck, which poses a major safety hazard. Penn State was concerned with the vibration caused by thousands of fans. Heavy-duty mounts - with safety chains - were necessary to protect spectators when the stadium erupts with excitement during game day. 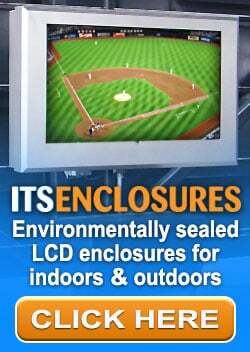 Penn State chose to install ITSENCLOSURES’ ViewStation Universal environmental LCD enclosure. A custom mount suspended two enclosures, side by side. Each enclosure holds a 32-inch LCD. Since there is no exposure to direct sunlight, filtered fans with supplemental heaters were installed to regulate the temperatures. Penn State purchased a total of 22 LCD enclosures and 11 custom mounts. The enclosures display live playbacks and keep fans updated on all of the action during the game. The LCD enclosures and mounts are finished in Penn State blue to match the University’s colors. Each enclosure is built to withstand the early season heat, as well as harsh winters in Pennsylvania.